$169.99 to $179.99 & FREE Shipping on orders over $59 $35. A smaller 8 Gallon Stainless Steel Kettle is also available. got this to use as a mash tun and am very happy with 2 of the other pots I have. Sturdy construction, great price, welded ports. Where quality meets affordability. Thick side wall, trim clad bottom, notched lid for immersion chiller. Already have one and expanding my set up. Thanks! How wide is this pot? BEST ANSWER: 18.5" at the lip and 22.75" at the handles. Nice welds and stout construction. The lid is much less robust, but hey, it's a lid after all. My only complaint would be that there are no gallon measurements etched into the side of the kettle. Other than that, it is a great piece of equipment! Great value. Great quality! Super thick sidewalls and Tri-Clad bottom. You will not dent this brew kettle. Can’t bet the price for this quality either. This kettle is exactly what I needed. Triclad bottom and thick sides will make sure this lasts a lifetime. The only thing that would make this better is to have volume indicator markings on the inside. Well worth the Price. The way it is made keeps the temp so much more consistent and it brews much better than the pot I was using. Love the spigot on the front as when it's full, it's far too heavy to move! Great pot and love finally have a good pot to brew in. The pot is very sturdy compared to my cheaper kettle. The downside of that is its much heavier. The weld on my lid also failed, which is odd considering it only bears the weight of the lid. It has made using the pot quite frustrating, but I'm hesitant to by another lid that might also fail. I'm also worried about safety since the lid is heavy enough to injure someone if it is dropped. I wish it had a riveted lid or a better weld, especially since other pots that cost the same have riveted lid handles. It's a big step up from the keggle I previously used. It's lighter, easier to clean and allows a better post boil whirlpool. Much more bling appeal too. I have one question. Has anyone successfully used the HD15 on an induction heater? I got this piece about 6 months ago and I've got to say I love it. It holds temp much better than I thought it would, the false bottom is perfect for keeping whole leaf hops out of your fermenter and it's a versatile piece to have. I just purchased a brew sculpture and it fits perfectly. No need to buy a different kettle or modify this one. Just put it on and go! I was looking for an upgrade from my turkey fryer pot and burner. I chose to go with this kettle and blichmann burner. I noticed improvement off the first batch. Everything heats up incredibly fast. The heat distribution is great! I've done measurements when heating water and there is almost no variance in the water temperature at the bottom and the top of the kettle. This thing is a workhorse. I've had it for 6 months now and it has treated my wort well. It is a good option for those out there looking for a keggle. One thing I would change would be for it to come with etched measuring lines on the inside to see how many gallons or liters you are working with. Great kettle. Good workmanship on all the welds. I should have this thing forever! When I made the jump to full boil brewing I purchased this kettle and increased my batch size at the same time. I have been very happy with the performance of my kettle. One thing I did not think of is that, no matter your strength, it is unsafe to lift 12 gallons of boiling wort. This kettle will work best with if you can chill and transfer to your fermenter without having to move the kettle. A slight oddity about the kettle: it holds 15 gallons, but is only 14 inches tall. A slight alteration to the design making the inside height an even 15 inches would make measuring your water much simpler. At 14 inches, however, it is close enough to not be significant. I purchased this at the MoreBeer store in Los Altos almost two years ago. It hasn't failed me once! The kettle is heavy duty and the tri-clad bottom spreads the heat evenly across the bottom. I've never scorched a batch using this kettle. Heats water and wort fast. I've always only used hand soap and bar keepers friends to clean it and I've not had any rusting or pitting. Bar keepers friend will keep this thing nice and shiny. My only line of advice, when you upgrade to a kettle of this size, you are going to want to get a pump too! After using this for five all grain (with morebeer false bottom) and two extracts, I really appreciate the kettle. It is a good value for the price and will be a workhorse for many years. I've ended up tipping the kettle forward to get the needed wort from sparging. The kettle is heavy. With 12-14 gallons of liquid .... very heavy. The two ports are easy to use and morebeer has many different thermometers and valves or stainless to hook up. I bought this to transition from extract to BIAB. Reaches target temp quickly and holds temperature beautifully. After doing the aluminum foil cover for immersion chiller method, using the notched lid saved even more time. I love this kettle! Same great quality as my MoreBeer 8 gallon kettle, but now I can brew 10 gallon batches. Nice addition to my home brewery. This works great. High quality, really thick, and solid construction. Have used extensively and still looks new. Works well for 10gallon batches. Like others have said, this is a great kettle. No worries about caramelized wort with this triple-clad bottom. And it's built to last. I look forward to a lifetime of use. -The outlet is a bit high, but can be adjusted with a pickup tube. -The thermometer coupling is too high for the end of a small batch when evaporation takes the volume below the 6 gallon mark. -And with the wide design, you will get below that mark quicker than expected. This thing loses a lot to evaporation. -The lid is a lid. I knew what I was getting, so no complaints there. Overall, a very well made kettle. Great kettle. Very heavy duty. You never have to worry about a boil over due to the surface area but the boil off rate is higher. Because of the thick bottom scorching your wort is a non issue as well. Highly recommend this to anyone. 2nd one for my RIMS system. For the price these are great! Purchased the pot on a sale. Definitely worth the money. Lives up to other reports for quality! The only downside is that pot is so big that it will require that I make additional upgrades to my system to use it effectively. Very happy I made the purchase. The best upgrade to my system yet! I absolutely love this kettle! 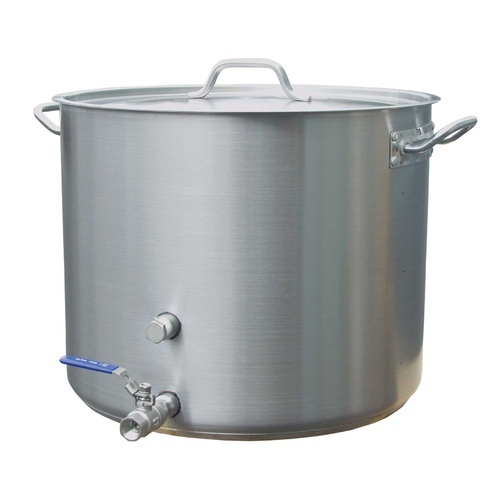 I brew 10 Gallon batches and this is perfect for up to a 14.5 gallon boil! The construction is solid and pretty, and the welds are flawless. I also like the larger surface area this provides because I don't get a boil-over as I did with my converted keg, and this kettle is much easier to clean than my old keggle. I will have this for years to come, but if I ever needed another kettle I would buy this one again. Well done Morebeer! I've brewed a 10 gallon extract, a 5 gallon extract, used it as a mash tun for a 10 gallon all grain ... it serves so many different purposes. Once you dial in your valves, thermometer, false bottom, etc_ it is supper easy to use. It is a beast and quite heavy. I bought the HLT version (with the extra port & sight tube) along with a false bottom and a hot liquor pump and use it as a 1-pot does everything! (Almost...) I heat my sparge water in it and drain or pump it into a 10 gal cooler for holding. Then I mash and sparge in it, dump the grains and use it again for the boil. As somebody else commented the thermometer location is optimized for an 8-12 gal batch, and is just uncovered at 5 gallons. The "obvious" solution for me was to do just always do 8-12 gal batches, which aren't much more effort or time consuming on brew day than 5 gal. That has let me ferment "identical" worts with different yeasts, different temperatures, different spices or dry hops, and so forth. My only wish is that the sight-glass port was also a full coupler (threaded on the inside) like the primary port for the ball valve. I bought this with the idea of easily doing 5 gallon batches with the option to easily do a 10 gallon full boil. It's a great pot and extremely well made! The only draw back I have found is the position of the hole for the thermometer is right around the 6 gallon mark. For 5 gallon batches, this is fine in the beginning, but once you complete your boil, the level of the wort is below the thermometer which makes it pretty much useless. For larger batches it would be fine. This is a seriously sturdy, heavy duty brew kettle. 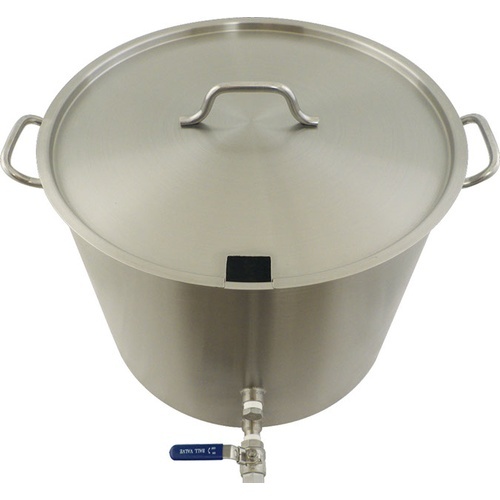 I have a couple of these in the 8 gallon size as well, it works perfectly as a hot liquor tank or brew kettle. No issues at all after numerous batches. I get a lot of great use out of my heavy duty brew kettle and its sturdy enough to withstand brew after brew without compromise. The large base provides even heat distribution for a great boil. Having this beast equipped with a ball valve makes liquid transfer relatively easy. My only complaint is that the fitting for the valve is higher than I would like, leaving about 1.5 - 2 gallons of wort left over to poor. There is definitely room to lower it another inch or so without worry of pulling trub off of the bottom while draining through the valve. Thanks MoreBeer for the great kettle! I made a 3-piece copper pickup tube that screws into the female port for my 26 gallon MB heavy duty kettle. Removes easily to clean and I can change the angle based on the amount of anticipated trub. Just ordered this pot today, so I'll be making a second one from hardware store parts. I bought it last week after my 8 gallon pot sprang a leak ,while brewing .made my frist 10 gallon batch on memorial day. What a pleasure it was,no boil over,no burnt bottom,easy to read thermometer and great to have a drain so no more syphoning or pouring.It is extremely well made and very heavy duty. Should have gotten it years ago. Now that i have it[the pot],I will be buying [in the future]a 10 or 20 gallon brewsculpure.Cheers to brewing MoreBeer. I purchased one a year ago and I've had absolutely no problems. I also purchased the false bottom which works great for pumping the wort through my chiller without clogging. Plenty of capacity for either 5 or 10G brews. Would have prefer it to be taller than wider so that for the occasional 5G batch, I didn't lose so much to evaporation but that's hardly a problem. Very sturdy construction. Buy with the wort chiller so they notch the lid! Very happy with this purchase. This brew kettle really reduced the scorching I was getting, even at low boils, in my cheaper, thinner kettle. It's heavy duty, easy to clean, and doesn't leak a drop. I am very happy with the purchase. I've been using this kettle for over two years now (50+ batches) and it's performed marvelously with no signs of wear or tear. I added a Blichmann thermometer and recirculate the hot wort through the patented MoreBeer Jamil-o-wort-o-matic chill tube doohicky(item #WC56) with a march pump and 25 ft copper immersion chiller. I normally make 6 gal batches, which is about the height of the thermometer port, but it has no problem handling up to 13 gal boils. The only thing I would change would be to include a notch in the lid that would allow the top of immersion chiller to stick out while keeping the rest of the lid sealed during chilling. This thing is solid. I use with a Blichmann burner and it works great. Be prepared for a rather high boil off rate. This was kind of a pain when trying to go for 10 gal batches. The high boil off required 14 gallons of preboil wort. It's still a great kettle. Just need to use it and then dial in your system. This has been my brew kettle for over 50 batches and is still basically new. The bottom is think tri-clad and heats quickly and evenly. I have a friend who brews in converted kegs with a much more powerful burner and I was amazed at how long it took to heat up. The sides and handles are thick enough to support the weight of the bottom more than adequately. A couple of potential cons, due to the shape (most pots are taller and narrower), boil off was greater than my previous kettle. This caused my recipes to be a little off at first (less volume, higher gravity). This took me a little while to get dialed in (on the plus side, I never have a problem with DMS). Additionally, for someone who has a hard time with heavy objects this may not be a good fit. It is heavy and it's not cheap, but you are getting what you pay for. I'm very happy with this pot, and would purchase again (if I didn't already have one (which is going to last nigh forever)). This kettle is a beast. I think it could withstand a lot of abuse without a dent. The tri-clad bottom especially makes it a great kettle that will evenly heat and hold that heat. It is a very wide kettle (tuna fish can not soup can) and so it does take some adjustment to get used to the massive boil-off that this large amount of surface area will give you. The bonus to that is that I have never had a boil over in this kettle- not even when I had it nearly to the top with a huge hot break. That huge surface area does not yield to boil overs. I would also recommend some form of dip tube. Since this baby is so wide that even the low placed valve with leave almost a gallon behind. I made a dip tube out of H624B stainless compression fitting and a bent piece of copper tube. This thing is great for 10 gal batches. huge upgrade from my previous 8 gal kettle w/out ball valve. Makes brewing quicker and cleaner. My first kettle, been brewing for 8 months. No need to upgrade, this is the perfect kettle for beginners and beyond. These are great, well-made kettles. I have the 8 and the 15 gallon. They heat well. The couplers for the valve and thermometer work perfectly. Didn't get it, but the sight glass would be a good addition. This is a very nice and well built kettle. I look forward to spending many years of brewing with it in my future! I bought mine on the black friday sale and got a really good deal. I use a really hot burner and never had scorching issues. It's very well made, solid construction that will probably last a lifetime. One thing about the lid is that it's a little thin on the edges. Mine dropped off the kettle about 2.5 feet and tweaked it a little as it hit the ground. It still functions fine but lifts a little where it's dented, and cosmetically it bugs me. Everything else is solid, and wouldn't hesitate to get another one if I needed it. This pot is awesome. It's super heavy duty and provides great heat distribution. I couldn't be happier with the quality of construction. I moved up from the Morebeer 8 gallon kettle and this one does not disappoint. I am now adding the 15 gallon HLT and Mash Tun. These are just sturdy, dependable, well built kettles that give great heat distribution. A joy to brew with. I could not be more happy with the kettle itself. It's heavy duty, conducts heat quickly and evenly and the inner threaded couplers make it easy to accessorize with a hop blocker or pick up tube of some sort. My only complaint is the weld quality on the handle of the lid. One of the welds broke shortly after I got it, but I only use the lid to keep the kettle clean in between batches so it doesn't affect me much. My friend has two of these kettles and and both welds on one of this lids handle broke. The other is fine. So of the 6 welds on the lids that I have seen 3 failed. Absolutely no problems with the kettle. I bought this as my first kettle into all grain and I can't be happier. It is very strong and the welds are done well. My recommendation is that you purchase what I think is called a maximizer so that you can use the ball valve included, even when the volume in the kettle is low. Otherwise, great buy. Just keep it clean and it will make you great beer. Great heavy duty kettle that stands up to all brewing needs. Solid construction and quality welds! This is my second heavy duty stainless kettle. I now use my 8 gallon at a HLT. I can't say enough good about them. High quality, even the sides are thicker than other kettles I've seen/ used. They are a breeze to clean, don't stain, and my 4 year old 8 gallon still looks new. The 1/2" ball valve and thermometer port are a very nice touch. I've only brewed 4 batches with this kettle so far but it has performed great so far. It has given me a reduced boil off rate vs. the narrower and taller kettle I was using before. I had to put a diverter in to avoid losing 1.5 gallons of wort because of where the coupling is welded in but otherwise this is a fantastic, heavy duty kettle that I expect to last many years!! I've brewed around 100 batches so far and they still look like new, I'm very happy with the quality of the stainless and how sturdy the sides and handles are. I am using 3 of these kettles for my setup at this point. I love the quality of construction, handle design, and value fittings on these. Additionally, they hold heat like crazy -- I have seen less than 5 degree drops on hour or longer saccharification rests. My only criticism is that a 15 gal kettle may not offer enough room for a larger grain bill when doing 10 gallon batches -- I kind of wish I had gone with the next size up for my MLT. I bought this pot as an upgrade for my 5 gallon aluminum brew pot. The qulaity is on par with other SS, but I've noticed some pitting on the sides of the pot. I don't use caustic cleaners as a rule. I work in corrosion prevention and control, so I don't use caustics unless absolutely necessary. Everything in aviation corrosion usually boils down to manufacturing or maintenance process. Be careful and do not remove the oxidation layer that forms on the pot. SS steel is self-healing due to the oxide layer formed as the steel oxidizes. Pitting corrosion can occur if you use caustics, or remove the oxide layer by scrubbing with some scotch brite scrub pads. I wish it was taller and less wide. I bought this kettle to do both 5 and 10 gallon batches. It works very well for both. My only complain is that it is very wide. This width causes my wort depth to be very shallow and my evaporation rates (in 5 gallon batches) to be much higher than my previous kettle. Overall I'm still planning on buying another one for my HLT.